delves into a world we cannot see, but is the very fabric of reality, the world of atoms, sub-atomic particles, and quantum fluctuation. Its a world of incomprehensible mystery, but one we experience every moment of our lives, even if we don’t realize it. To journey within is to experience this reality. MICRO enables people to take that journey. Together, the participants recreate this world where particles, waves, and vibrating energy are all interchangeable states. This is realized with strands of hanging balls that light up and make sound from within when bumped. 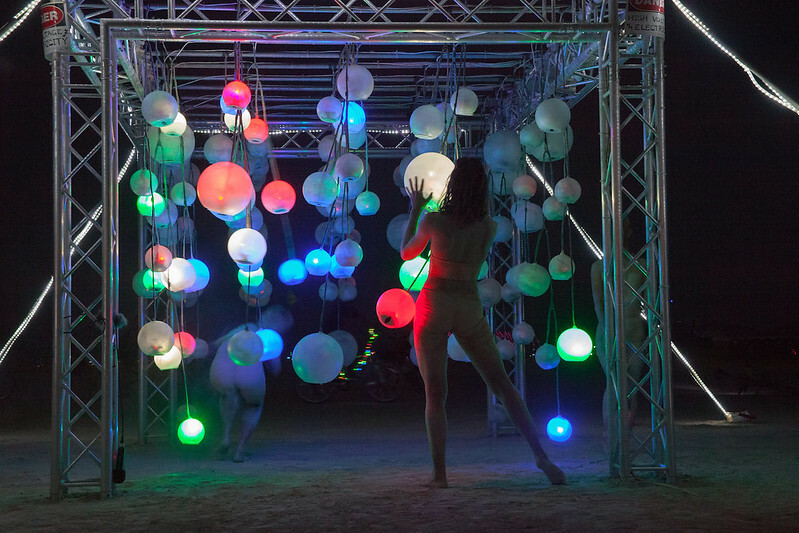 As people touch the balls, each ball replies with a different sound and light (each having it's own speaker and LED within). MICRO is a Purring Tiger collaboration. I was one of the lead artists and did all the music, electrical design, and engineering. MICRO has received grants/commissions from Burning Man Arts, Federation Square/Pause Festival, and the Cameron Arts Museum. More information about how it was made can be found on the project's blog.